For the last two years, my University has been live streaming our Commencement ceremony using YouTube. I like YouTube because getting a live event setup there is very easy, and content distribution systems don’t get much more robust than YouTube’s. I don’t have to worry about multiple bit rates, mobile streaming and so on, YouTube handles all that. Where the YouTube experience breaks down, at least for content creators, is YouTube’s copyright matching system. It seems to allow just about anyone to make a claim on a video, and it seems to be less about getting copyright materials taken offline, but rather to allow a company to put their ads on any video and make money from it. Last year, I wrote pretty much the same blog post about YouTube’s matching and a company that kept claiming we were using a song called “Journey to India Megamix.” I assure you we were not. Other people in the comments said their commencement videos were having the same claims made. After several disputes using YouTube’s online system, I contacted our legal affairs office and they handled it in a matter of a few days and the claims stopped. Color me surprised when I came to work today and saw two more bogus claims on our 2015 commencement video. Sure, the system is busted, but it did give me a good laugh today. It seems an unnamed “music publishing rights collecting society” has made a claim on my commencement video. Keep in mind we have a live band that plays exactly three songs during a three-hour ceremony: Pomp and Circumstance, the Star-Spangled Banner and our Alma Mater. “Hello Muddah, Hello Fadduh (A Letter from Camp)” is a Grammy Award-winning novelty song by Allan Sherman and Lou Busch, based on letters of complaint Allan received from his son Robert while Robert attended Camp Champlain in Westport, New York. 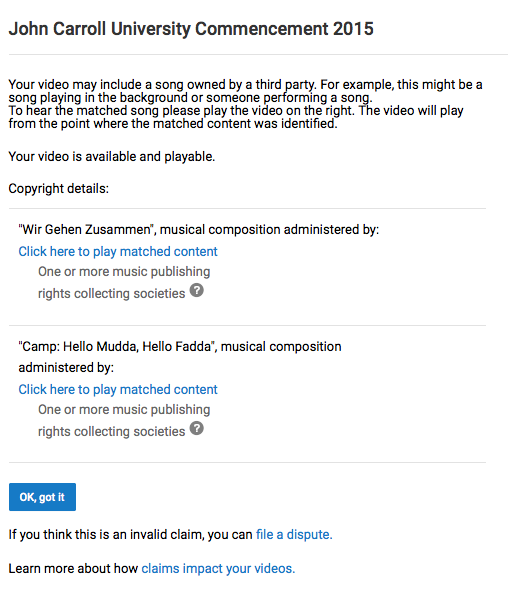 I can also say we did not play “Wie Gehen Zusammen.” I’m sure it’s a lovely song, and one my wife, who is 100% German, probably knows. But I reiterate we didn’t play it at our Commencement. Because of YouTube’s system, the onus is on the content creator, and not the copyright owner, to prove the use of the materials is legitimate. It’s not a huge deal for me, who uploads just a few videos, but I can imagine it’s a giant hassle for people who are constantly uploading videos. I will dispute these claims, and if that doesn’t work, I will get our legal team involved. I’m lucky to have such a resource, many people probably do not. The system needs fixing. In German, that’d be das System repariert werden muss. The biggest problem I have right now is how to get out Music Nation scammer network.